This book was fairly short, and while it wasn’t my favorite book in the world, it was a nice read. It was translated beautifully, and I liked the way it was divided—short, easy chapters that could probably suffice as standalone short stories. 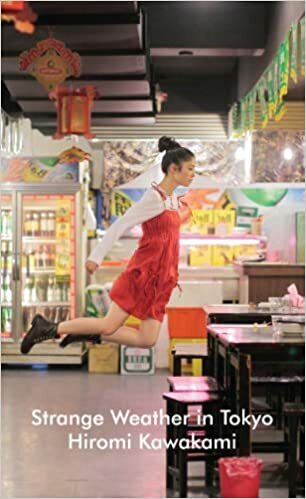 It’s about Tsukiko, 40 years old, who meets her old high school teacher in a bar one night—she only ever calls him ‘Sensei’—and they become friends over frequent, sporadic meetings, which then develops into an awkward sort of love. It’s very sweet, and very differently styled when you compare it to Western writing—some chapters, short as they are, read like poetry, with a sort of sense of rhythm you don’t get very often in books; they felt like long, flowing haikus, and I liked that about it. Another thing about the styling is that it was very abrupt, especially the ending, but the random jolts of plot development were there throughout. It felt very weird, but at the same time the writing had a smooth, dreamlike quality with phrases like “the moon was once again enveloped in haze” to end chapters. The thing I didn’t enjoy was the lack of plot – nothing much happened apart from what it stated on the blurb, and it felt a bit like rambling at times, as if certain bits—especially those involving characters apart from Tsukiko and Sensei—were just ‘padding’, filler text to space scenes apart. Overall, though, it was fairly enjoyable, maybe not my favorite style of prose but nice nevertheless. Age-wise, it was a bit of an anyone-and-everyone book, as there isn’t a specific age I’d recommend reading it at. 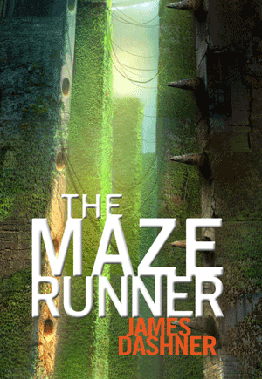 This is the third book in the Maze Runner trilogy. It was good—even heartbreaking at certain points—but for the final book in the series, it just felt a little ambiguous? It was a great read, don’t get me wrong, just as fast paced and thrilling as the first two, but I expected a few more questions to be answered—the first two were action—packed and spent very little time explaining details, and as Thomas has no memory when he arrives in the Glade, right at the beginning, this meant I was hoping for things to get a little less murky. Things continued moving fast, which is good for not dragging the book out, but not so great if you’ve left a lot of things unanswered. On the other hand, I would’ve read it no matter what, especially since the first two books were so fantastic, so if you’ve already read Maze Runner and Scorch Trials just go ahead and read the last one, too—but don’t expect too much. It’s enjoyable, but not as wonderful as it could’ve been. The amount I’ve criticized this book probably makes it feel like you shouldn’t even bother reading it. Not the case—I’m just being picky. If you haven’t started the series yet, you should, simply for the fantastic first two books. If you’ve already read the first two—again, you should read this one. It’s not the conclusion I would’ve gone for, but it’s a pretty decent conclusion nonetheless. “Before Sloane, Emily didn’t go to parties, she barely talked to guys, and she didn’t do anything crazy. Enter Sloane, social tornado and the best kind of best friend—someone who yanks you out of your shell. This book is a nice, easy summer read. I got through it in a few hours – though maybe I’m just a little bit obsessive – and it wasn’t particularly challenging. It was a sweet book, not as annoyingly girly as a lot of other ones I read over the summer. One thing I have to say is that it’s a little bit obvious – it was very clear right from the blurb what was going to happen, as nothing aside from what the blurb details actually happens. We don’t actually encounter Sloane until near the end of the book, so we mainly get to know her through a series of flashbacks. Emily has turned Sloane into some kind of perfect girl in the earlier flashbacks, and I was all prepared for the moment at the end where we realise just how evil and manipulative Sloane really is, but it didn’t come, which was a pleasant surprise. Sloane does become a little more human as the book goes on, though, which was nice. The characters were easy to relate to and the book was generally easy to get lost in. It was aimed at teens – teen girls in particular, which is pretty clear from the front cover. I didn’t like Frank very much, I’ve got to say – he was ordinary. (But then again, I prefer characters like Jace or Tobias, so I’m biased.) But the sheer fact that he wasn’t extraordinary in any way – no magic powers, no dark past – made him and Emily far easier to relate to. The whole “I’ve got a girlfriend, we’ve been happy together for years and years” thing seemed a bit cliched to me, but then I’m picky like that. One thing I adored was Emily’s family. The whole idea of “Living Room Theatre” made me laugh and every scene including her family was incredibly fun. Overall – it’s one of those things that you’ll read when bored over the summer, enjoy it more than you anticipated, and then forget about the next month because it’s nothing special. It’s a good book if you’re looking for a light read, though, and the characters are pretty relatable. “Two years before Beatrice Prior made her choice, the sixteen-year-old son of Abnegation’s faction leader did the same. Tobias’s transfer to Dauntless is a chance to begin again. Here, he will not be called the name his parents gave him. Here, he will not let fear turn him into a cowering child. This isn’t a review so much as a quick note, as the book is ridiculously short, but it felt like a crime not to mention it after all my raving about the Divergent Trilogy, so here goes. I adored this. I didn’t particularly enjoy the foray into Tobias’ perspective in Allegiant – I mentioned that I found it too similar to Tris’ voice – but this book was brilliant. It’s split into four parts. Each are relatively short, with the whole book totaling something like 300 pages – nowhere near the length of Divergent, which (I think) is the shortest of the trilogy. The book is made up of The Transfer, The Initiate, The Son, and The Traitor,as well as a couple of short excerpts. They show Tobias’ life with Marcus, his transfer to Dauntless, as well as a bit about how he was offered the position of Dauntless leader. The final snippet is about Tris, and it takes place during the Divergent timeline. Although I really enjoyed them, it felt almost like a draft of a book – even more so when you think about how Roth originally planned for the trilogy to be from Four’s point of view. I felt like she could have done a lot more with it. 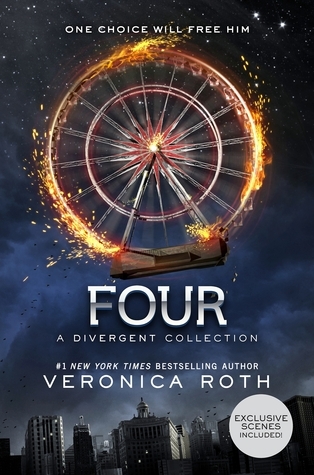 Otherwise, though, it’s a must-read for fans of the Divergent Trilogy. I think the snippets are also available as separate eBooks – but it’s really satisfying to see all four books together on your bookshelf! This is the first in Clare’s Infernal Devices trilogy, which are basically prequels to Mortal Instruments. Tessa arrives in London from New York to stay with her brother, Nate, after her aunt – her only guardian – passes away. When she arrives, however, she meets the sinister Dark Sisters who insist they have been sent by her brother; eventually, it turns out that they have some other ideas. They keep her prisoner and she learns that she has the ability to turn into anyone and access their memories as soon as she touches something that belongs to them – and this ability makes her one of the most hunted people in Downworld London, a place where vampires, warlocks and other creatures roam – as well as Shadowhunters, whom she eventually seeks refuge with. I didn’t enjoy this nearly as much as I enjoyed City of Bones, sadly, because it was far too similar to Mortal Instruments – and I know people who dislike Mortal Instruments because of the similarity to Infernal Devices, depending on which series they read first. The Shadowhunters, Will and Jem, seemed irritatingly familiar throughout the book – although I adored Will. Essentially, this is because Will is a Jace who looks like Alec and Jem is an Alec who looks like Jace. (Alec and Jace being characters from Mortal Instruments.) There’s also another love triangle, as in Clare’s previous books – so essentially, the book failed to get me hooked. Clare’s writing is pretty good, but the lack of new ideas meant I didn’t really enjoy the book. That said, though, I probably would’ve enjoyed the books more if I hadn’t read Mortal Instruments first. Overall, though, I recommend reading Mortal Instruments over these – I enjoyed those more. The book’s aimed at teens – probably twelve-ish and above, really. It doesn’t matter much with these books. They aren’t bad, but they aren’t fantastic, either. Heavenly Fire is the sixth and final installment in Cassandra Clare’s The Mortal Instruments series. I didn’t particularly enjoy the series – I liked them, sure, but they weren’t fantastic. If you’ve seen a copy of Heavenly Fire, you’ll know the book resembles a brick in terms of thickness – it’s really long. In Heavenly Fire, Clary, Jace and the others are trying to stop Clary’s brother, Sebastian, from taking over the world and destroying Shadowhunters. The Heavenly Fire in Jace’s veins seems to be the only way to stop Sebastian, but Jace doesn’t know how to use it. Things are getting dark – Sebastian is attacking institutes and Turning Shadowhunters. Sebastian and the Seelie Queen are working together. So Clary, Jace, Simon, Alec and Isabelle go to the demon realm to rescue Jocelyn, Luke, Raphael, and Magnus and defeat Sebastian. Do they succeed? Well, pretty much, yes. The book starts off introducing the characters of Clare’s next series, The Dark Artifices, and quite a lot of the book was spent setting the stage for those books. I found those parts particularly boring, as I doubt I’ll read TDA when they come out, and I found myself skimming those parts to get to the good bits. 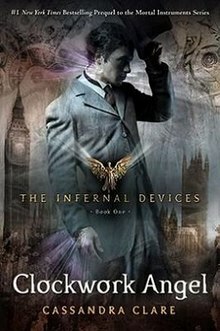 There was also quite a lot of reference to the prequel series, The Infernal Devices, and as I hadn’t read those yet I found myself wondering who on earth Tessa Gray was and how Brother Zachariah was connected to her – and why this whole idea was being introduced so late. I’ve now read the first of The Infernal Devices, which is called Clockwork Angel, and I think I’ve got an idea of what was going on, but I think for people who haven’t read TID it will be quite confusing. It was for me, anyway. As for the bits about the TMI characters we all know pretty well – they were enjoyable. Mostly. There were slow bits, as in every book, and there were the nice bits. Starting the book, I think everyone knew everything was going to turn out okay – evil would be defeated, some people would die, but everything would be fine. I have to say I loved the way Sebastian died. It was lovely how the Heavenly Fire wiped out the demon in him and for a little while, he was the brother Clary could’ve had if Valentine hadn’t done what he did. His death was wonderfully sad. The other part I really liked was when Simon had his memory wiped. (I adore sad endings.) I do think, though, that it felt too neat to bring Simon back – I feel like Clary was coping and that it was a little bit too forced, like Clare sat down and thought, “right, how can I bring Simon back?” rather than just leaving it how it was. I felt like it was a war, so realistically at least one of the group of main characters should’ve died: one from Clary, Jace, Alec, Isabelle, Magnus, Luke, Jocelyn. I know Jordan did die, but it felt too rushed for me. Overall, it had it’s moments, but I felt too much time was spent on Infernal Devices and Dark Artifices – it relied heavily on them instead of spending time on the Mortal Instruments characters, which meant the book moved sluggishly. A good book overall, though. It’s aimed at teenagers, probably around twelve or thirteen.